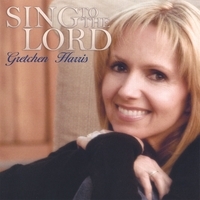 "SING to the LORD" is the outstanding sixth release from Gretchen Harris, UCMVA's 2006 "Female Vocalist of the Year." Gretchen is a Catholic Christian singer/songwriter whose music expresses her deep love for God and Church. This album also features three very special duets, with Matt Maher, Robert Kochis, and Carl Herrgesell sharing their exquisite vocal talents with Gretchen. Many superb studio players from Nashville and L.A. provide excellent musicianship as support for this CD honoring Our Lord God! Songs from Gretchen's six CDs can be heard on Catholic and Christian radio stations in the United States and many other countries, in addition to the worldwide radio outreach of EWTN. Gretchen Harris is one of the most well-known and beloved artists in Catholic music. Her music has a universal appeal because of her vocal talent and excellent song choices. Sing to the Lord is her sixth offering and to me it was like sampling fine gourmet food. Many of the songs are classics in Catholic liturgy: “You Are Near,” “Prayer of St. Francis,” “Breathe” and “Shepherd Me, O God.” Normally I am not crazy about the covering of such familiar songs but Harris was successful in creating fresh arrangements. The old adage, “It’s all in the details” definitely holds true here. The careful attention to every vocal nuance, every note played creates a beautiful listening experience that nourishes the soul. “Prayer of St. Francis” is one of my favorites. I have a weakness for quality acoustic guitar playing and here it so complements the vocals of Harris and her duet partner, Matt Maher. There are two other duets of note as well: “Every So Gently,” a haunting piece with Robert Kochis, and “Friend of God” with Carl Herrgesell. The familiar songs, the careful planning and attention to detail, and the lovely execution . . . just like a fine gourmet meal. Sit down with this one and drink in the blessings like a fine glass of chardonnay. Gretchen's prayer release, THE ROSARY, has all four sets of Mysteries, including the Luminous, on 1 CD. It is led by 4 different priests with beautiful background music. Each complete rosary is 18 minutes of meditational prayer. CHRISTMAS JOY, combines traditional favorites with new songs of the holidays. This is a delightful journey for the soul as we travel through the Christmas season with the joy that it holds for our hearts. HOPE FOR TOMORROW was the "Pop/Contemporary Album of the Year" winner! This is a soothing collection of contemporary music, with comforting lyrics to help people cope under extremely trying circumstances. It has a message of hope in God's presence, even in the darkest times. SIGN OF LOVE contains many original songs, with Gretchen's lyrics expressing her simple and honest love of the Lord. This contemporary album has the talents of many top musicians in Los Angeles. The music has been moving and inspiring lives with it's full pop sound as well as the tender, beautiful ballads that facilitate prayer and touch the heart. SING OF MARY, nominated for "Praise and Worship Album of the Year," is a beautiful collection of Marian favorites. This album includes songs from ages ago to new contemporary favorites. Gretchen has a special devotion to the Blessed Mother, and on a pilgrimage was blessed to receive a special sign to sing to Mary. She recorded this album in gratitude and love for her. Recent television appearances have been in Boston, San Antonio, Ohio, and includes a half hour concert showcase on EWTN's BACKSTAGE and performances on Dana's series WE ARE ONE BODY. Dana selected Gretchen to sing with her and Mark Girardin on the recording and the video of the powerful pro-life song "THIS IS MY BODY." This recording was honored with Unity Awards for "Contemporary Song of the Year" and "Music Video of the Year." It's one of Gretchen's deepest honors to take part in that song in respect for Life. Gretchen ministers through concerts, speaking engagements, and radio programs, performing most recently in Italy, Germany, Canada, Brazil, all over the USA, and in her hometown of Los Angeles, California. In addition to her vocation as wife and mother of three children, Gretchen enjoys reaching out to others through her music ministry. She is busy ministering with her music, and she would love to come sing at your church! Gretchen's Sing to the Lord is peaceful and soothing. Her voice is a true blessing...I love this CD!